Perhaps in no other place is there a so great concentration of sacred stories and events, representing the need of transcendence of this ancient people, as the archaeological finds from the Italic necropolis at the foot of Monte Cerro suggest. On Monte Circolo, in 250 A.D., San Massimo, who later became the patron saint of the city of L’Aquila, suffered martyrdom; and on the peak of Monte Circolo we can still admire the remains of the Castle of Ocre. Further down the mountain there are more ancient remains: those of the Mithraic temple consecrated to the Sun-god and known among the locals as the “ciciuvetta” (little owl). 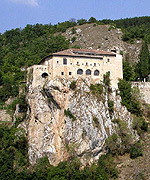 There is a historic “continuum”, a sort of linear relation, that marks a history of not-only-Christian sacredness and reverberates a unique light on this territory and, in particular, on two of the most suggestive places in Abruzzo: the Monastery-Fortress of Santo Spirito, and the Convent of Sant’Angelo of Ocre, halfway between San Panfilo d’Ocre and Fossa. Beato Placido of Roio, Beato Bernardino of Fossa, Beato Anselmo of Pizzoli, Beato Timoteo of Monticchio, Beato Ambrogio, Beato Domenico and San Cesidio of Fossa followed their evangelic vocation from the Convent of Sant’Angelo. The latter was a young missionary martyred in China in 1900 by the bloodthirsty “boxers” and was then canonized by Pope John Paul II in 2000. This place, rich in mysticism and religiousness, was characterized by charismatic figures, whose relics are kept here as a token of sacredness which is part of the history of the territory.